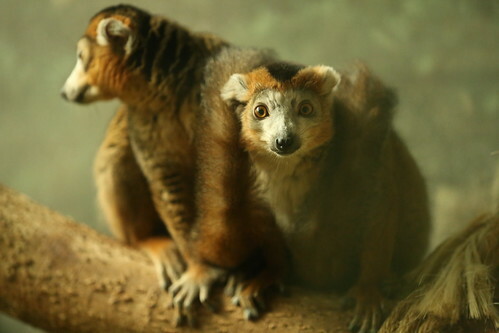 This small lemur species is named for the the crown-shaped, orange pattern of fur above its brow. The genders have distinctly different coloration. Males are chestnut-brown overall while females are gray. 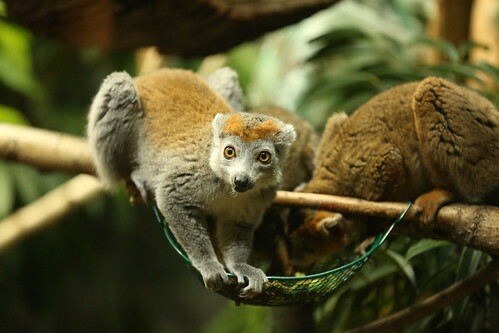 Crowned lemurs measure 13–15 inches long and weigh 4–5 pounds. 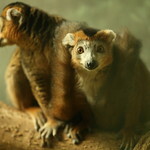 They have slender limbs and a long, 17–18-inch tail that helps lemurs balance when moving through the treetops. Crowned lemurs are found only in the northernmost area of Madagascar. 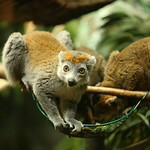 Crowned lemurs are endangered. In the past, rugged terrain inhospitable to people helped protect crowned lemurs from human encroachment. Today, logging, burning and grazing have fragmented their habitat, isolated populations and disrupted traveling patterns. Increasingly, they are also poached for food. The species inhabits dry, deciduous forest and mid-altitude rainforest situated on rugged, limestone-shaped terrain. 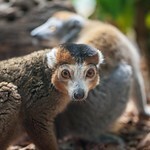 Crowned lemurs forage at all levels of the forest canopy for fruits and leaves and sometimes insects. They are primarily diurnal—active from sunrise to sunset—but occasionally travel after nightfall. In the wild, crowned lemurs live in close-knit social groups of 5–6 individuals led by dominant females. 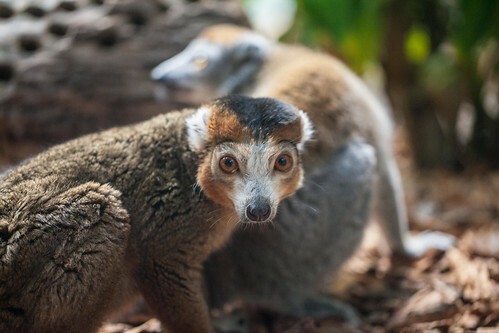 Female crowned lemurs are just as likely to give birth to twins as one offspring. Mothers nurse their young for 5–6 months. 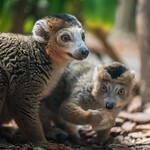 Crowned lemurs reach maturity at 20 months. Like all lemur species, crowned lemurs have a dental “comb” formed by the lower six incisors and canine teeth. They spend much of their time grooming themselves and each other with this comb and claws well adapted to the purpose. 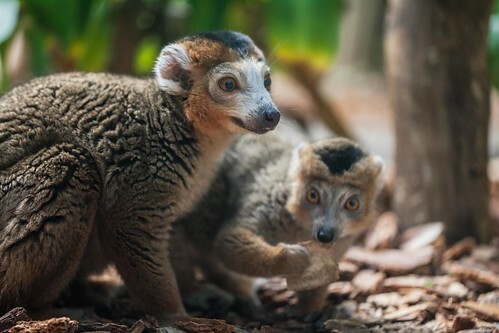 Lincoln Park Zoo is thrilled to announce the arrival of new zoo royalty: a crowned lemur was born on April 17 at the Helen Brach Primate House.